A detached four bedroom family house with a large double aspect lounge running the full width of the property. The separate dining room overlooks the rear garden and leads through to a well fitted kitchen with several integrated appliances. The ground floor also has a good sized hall and cloakroom. 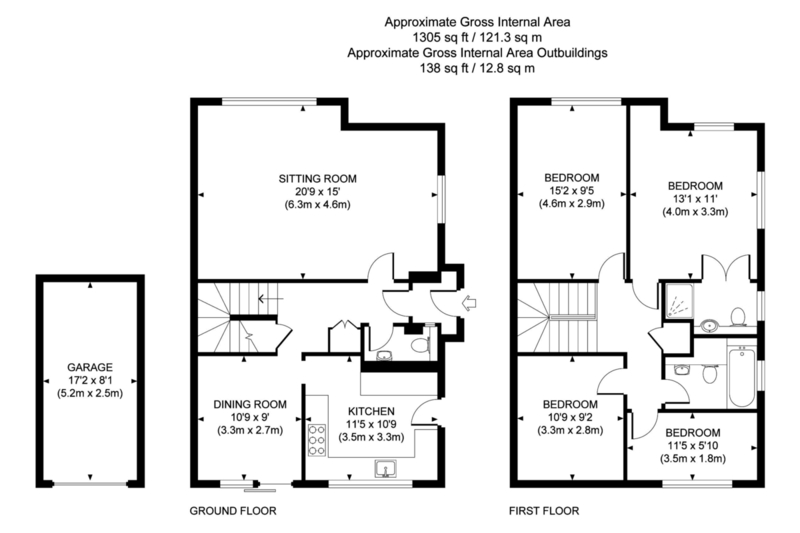 On the first floor the master bedroom has an en-suite shower room and the further bedrooms are all of a good size. There is also a family bathroom. To the outside is a drive providing off the road parking and this leads to the garage that has electrically operated up and over door, power and light. The rear garden is landscaped with a terrace adjacent the property, an area of lawn and well stocked flower and shrub borders and also has a southerly aspect. The property benefits from double glazed windows and gas fired heating to radiators. The property is situated in a slightly tucked away location in a no-through road and has excellent access to the village centre, local schools and Billingshurst railway station. Radiator, understairs cupboard, additional cupboard, turning staircase to first floor with half landing and double glazed window. White suite comprising: concealed cistern w.c., wash hand basin with mixer tap and storage under, tiled shelf, radiator, single glazed window. A large bright room with a double aspect and a large picture window, both windows being double glazed two radiators. Comprising: worksurface with inset one and a half bowl sink unit with mixer tap having base cupboards and drawers under, integrated dishwasher, integrated four ring gas hob with base cupboards under, cooker unit housing an oven with storage above and below, further matching worksurface with base cupboards and drawers beneath and space and plumbing for washing machine and tumble dryer, space for tall fridge, range of matching eye-level units, stainless steel extractor hood over hob, concealed gas fired boiler, double glazed large window overlooking rear garden, part double glazed door leading to outside. Airing cupboard housing hot water tank, access to roof space via pull down loft ladder. Double aspect with two double glazed windows, radiator. White suite comprising: tiled shower cubicle with electric power shower, vanity unit with inset wash hand basin with mixer tap and cupboards under, concealed cistern w.c., radiator, double glazed window, extractor fan. White suite comprising: panelled bath with twin hand grips and mixer tap, electric power shower (curtain and rail), wash hand basin with mixer tap, mirror over, light/shaver point, concealed cistern w.c., heated towel rail, double glazed window, extractor fan. Electrically operated garage door, power and light. Almost entirely laid to lawn with a small area to the side providing additional hard-standing. Adjacent the property is a full width terrace with a deep well stocked flower bed. The remainder of the garden is mainly laid to lawn with flower and shrub borders. To one side is a wooden pergola with climbing plant and aluminium greenhouse and timber garden store.